The pardon by the honourable president of AHM Biplob for his heinous murder of the BNP leader and lawyer Abu Taher is quite shocking, I am sure, to all of the people of Bangladesh. A question that may arise is: do presidents reserve the right to pardon criminal? Of course they do, given good reason. Some days ago, AL Leader Suranjit Sen Gupta said that in pardoning Biplob, proper procedure had not been maintained. Abu Taher's wife asked “Will the president ever pardon someone who killed his wife?” We know that showing mercy is a great virtue--but in most cases pardoning a murderer has not contributed to the well being of society as well as of the country. So I urge lawmakers to do away with this law that allows leaders of our country to free murderers and dangerous criminals without justifying themselves. Do books have a future? Ofcourse they do. But nowadays, reading books is becoming obsolete because mostly, everything we read is on computers, ipads, itouch, etc. Anyone can download books from the Internet and read them. Moreover there are hardly any public libraries in our city where we can sit and read a book the old-fashioned way. When we go to a bookstore, we rarely get the original versions of the books we want. Mostly, only the abridged versions are available. I know reading books online seems the easier thing to do, but I will say that Internet threatens the long-term survival of books. As more and more writers' works become accessible online, the entire tradition of reading books in hand is being erased from our lives. Books, in the traditional sense of the word, have several advantages: they can be carried almost anywhere, they feed our imagination, arouse and inform us, and introduce us to new ways of understanding the world. Most of human knowledge is recorded in books. And one way we can preserve the tradition of reading books is by making more public libraries in Dhaka. Also the people who do not have the resources to buy books can read them for free. Needless to say, education is the backbone of a nation. Napoleon once said: “Give me an educated mother, in return I will give you an educated nation”, explaining how vital a role is played by education in the prosperity of a nation. There is no alternative to education in the development of a strong nation. We have thousands of students who pursue a higher degree after the completion of their HSC or 'A' level or any other secondary level education. And every year this number is increasing noticeably. Due to lack of seats in public universities, a surplus number of students are seeking admission in private universities. Now the question that arises is that if there were no private educational institutions then where would these students go? The answer is, either abroad, or if they cannot afford that they would lose an opportunity to attend university altogether. 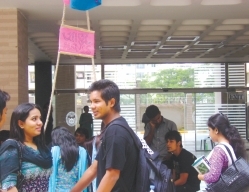 It is beyond any doubt that private universities are making great contributions in the educational arena of Bangladesh. If I'm not mistaken, currently, there are about 54 UGC (University Grants Commission) approved private universities in Bangladesh. The government had decided to impose taxes on these private universities, but later withdrew their decision after students all over the country protested against it. Controlling the quality of education in these institution is desirable, but it cannot be done by imposing taxes because, as it is, they are quite a bit more expensive than public universities and taxes would ensure nothing but a rise in the tuition rate. The tax imposition on educational institutions is simply illogical and an utterly inappropriate initiative. The UGC is there to evaluate and ensure quality education of these private universities. But the UGC seems to be remiss in its duty as most private universities' authorities are now manipulating their funds by means of recruiting unqualified teachers for low remuneration packages, whereas per credit cost of a course is very high compared to the quality and standard of teaching. If this tradition is carried on, students all over the country will suffer. It is high time the UGC audited these educational institutions to ensure quality education for a prosperous nation. While reading the article "Breathing Life into the Voids" (in the Star Magazine of 15 July, 2011), I remembered Bertolt Brecht's famous play "The Good Person of Szechwan". This play was adapted into Bangla and successfully staged in Dhaka in the name of 'Sat Manusher Khoje', with Sarah Zakir in the lead role. In the context of our various national problems such as poverty, illiteracy, ill health and over-population, we very urgently need a quick and early industrial revolution, and for that we need many a 'good person' like the one of Brecht's Szechwan. It seems, like the gods in Brecht' play, you have found in Maj. Gen. (Retd.) Amjad Khan Chowdhury such a worthy 'good person' of our own soil. My thanks to you for that. What about finding many other such worthy 'good men' of our country and regularly projecting their lives and deeds in the DS and the Star Megazine for all of us to see and acclaim? The bold and courageous 'good men' who are presently nurturing our newly grown up shipbuilding industry can surely be in the line. Letters to the Editor, Star Diary and Write to Mita, with the writer's name and address, should be within 200 words. All articles should be within 1,200 words. A cover letter is not necessary, but every write-up should include the writer's name, phone number and email address (if any). While The Star welcomes unsolicited articles and photographs, it cannot accept the responsibility of their loss or damage. The Star does not return unsolicited articles and photos. Response time for unsolicited write-ups ranges from three weeks to two months. All articles submitted are subject to editing for reasons of space and clarity.